Trapwords is the newest word/party game from CGE. Given the huge success of Codenames, the Czech company has found a gaming niche which they are happy to fill. In Codenames, players tried to give clues in order to get their teammates to choose (multiple) words from an array on the table. There were a number of assassin words, determined by a randomly drawn card, which would cause an automatic loss if your teammate chose them. This simple and elegant formula has spawned a number of different extensions and expansions. Trapwords is a little different. In this game, the active player still gives clues to their teammates – though this time, they’re trying to get their team to say ONE specific word. There are also words which will cause an automatic loss for the round – but this time, they are restrictions on what can be given as clues… and to make it harder, the cluegiver doesn’t know what they are; as they are chosen in secret by the opposing team! So, to play, split up into 2 teams. Each team designates a clue giver for the round. There is a torch standee which is put in front of that player. There is a board made up of 5 tiles – in increasing numerical order – basic rules say to use rooms 3, 4, 5, 6 and 7. The monster is placed in the room at the end of the track (pick a card at random from the monster deck). The game will be won by the team who is able to defeat the monster. Two curse cards are chosen at random from the supply and put next to the second and fourth rooms in the track. As you are more familiar with the game, you can change the values of the rooms as well as the frequency of the curses… Each team gets a double sided trapwords sheet which is split up into 8 different areas. Also, the teams decide whether they want to play with normal words or fantasy words – and take the corresponding book for the word list they want to play. In each round, teams draw a word card from the deck and put it in their book. This is the card that their opponents will use in the round. But, before the opponents get to see it – your team gets to create some trapwords. Open the book and see which word is highlighted. This is the target word. Your team now gets to think of words that the cluegiver might use when trying to get their opponents to say the target word. For instance, if the word is luggage – you might think of “suitcase”, “duffel”, “airport”. The words must pertain to the target word, you can’t use generic words or articles of speech here… There are all sorts of rules on what are valid clues and trapwords, but they are mostly common sense, and if you really want/need to know – you’ll find them in the rules when you are going to play. The number of trapwords that your team is allowed to come up with is equal to the number on the space of the track where the opponent’s team marker is. Pass the list around the team, and then once a list is generated, it might be easier to point at words to cross of the list until you come down to the limit. Keep your list hidden from the other team! When both teams have made their list, the team which is behind gets to go first. Their book is given to their cluegiver (remember, the player with the torch in front of them), who gets to open the book, read the target word, and then the timer is flipped over. The team is successful if one of their five guesses is the right word or contains the right word. (i.e. if the clue is “light”, then a guess of “moonlight” would still work). However, related forms of a word are not good enough – i.e. “scientist” would not win if the word was “science”. If the team guesses correctly, their figure is moved forward to the next room. The team fails if the clue giver says a trap word or a form of a trapword. Here – “scientist” would trigger the trap is “science” was written down. (Yeah, I know, it’s kinda fuzzy here). The team also fails if the correct word isn’t guessed in 5 tries OR time runs out. Also, the round is a failure if a bad clue is given – bad clues are mostly those which use a form of the target word, examples of a word (i.e. using “siamese” for “cat”), or proper nouns. Once the first team has gone, regardless of outcome, the other team gets a chance to go. All the mechanics are the same, but the roles are reversed for the teams. If it turns out that both teams have failed (and neither is in the same room as the monster), move the monster one room closer to the players. If there is curse card in that new room, it is pushed towards the players as well – that is, there shouldn’t be a curse in the room with the monster. In succeeding rounds of the game, make sure to note where your opponent’s team marker is – this tells you how many trapwords you get to write down! If at least one team is in a room with a curse card next to it; this could be because the marker advanced forward into the room OR because the monster moved and pushed the curse card into a room. The curse is revealed and the instructions on the card are used for the current round; they will make it a bit more challenging to give clues. After that round, they are discarded. When a team starts a round in the same room as the monster, they will have the chance to win the game – the team or teams that correctly guess the target word in the monster room wins the game! Well… at least in the first 8 rounds. If the game goes longer than 8 rounds, and no one has won, then the monster grew bored, and just ate everyone for a snack. I have loved the idea of this game since I first saw it at GenCon. We actually made a mockup of the game using Codewords cards initially, and later made a second one from Word Slam cards. We’ve had a great time with it – with a few rules that we just kinda made up as we went as we didn’t have the real rules. In the end, we pretty much had most things remembered correctly (we forgot about the limit of 5 guesses). But, as much as I liked my homebrews, I’m glad to have the real thing now! Like many word/party games, this is all about having fun, making clever clues and guesses and having a good time. Like my other favorite games in the genre, Codenames and Decrypto, there is opportunity for this type of great play in every round, and that’s what makes it so engaging for me. Heck, I have even managed to successfully give a cryptic crossword clue – that was pretty awesome – “British apartment without a lobby” for the word “fat”. My usual group tends to be a bit lax with cluegiving as we prefer to allow for more inventive clues, so we actually often play allowing proper nouns. Normally, I’m not much for house rules, but this is one that has always worked for us, and honestly, with any of these sorts of games, as long as everyone playing is aware of the specific rules, I’m for anything that increases the fun in the game! The other thing which I love about this game is the whole Princess Bride/Fezzini aspect to trapwording. When you start playing, teams tend to choose the obvious words that relate to the target word. But, of course, your opponents are smart, and they tend to not say those words anyways. So, since you know that, you will then leave the obvious words off the list because it’s not like your opponent is going to use a clue which is so obvious that it has to be on the list, right?! For instance, if the word was Mars – you might think of trapping words like “planet”,“red”,“asteroids”. But, of course, your opponent isn’t going to use those – they’re too obvious! Or are they? It’s always amusing to see a clue giver try to guess at what might have been used as a trapword especially once you add in the reverse psychology bit. The artwork is pleasant; though this really isn’t a game about art. It’s a word game. The styling is familiar, though to me, the colors and font actually remind me of a Days of Wonder game. 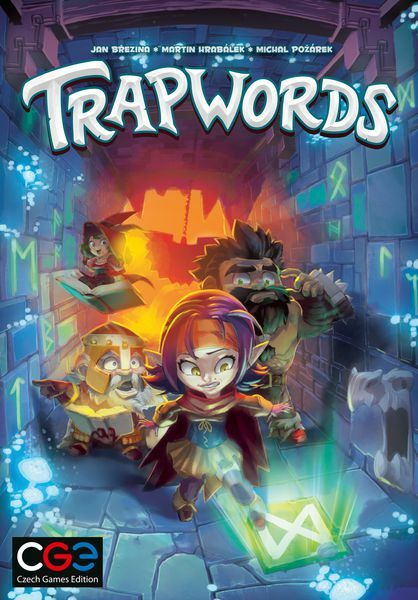 Everytime I see the Trapwords logo, my brain thinks that this should sit on the shelf right next to Small World! I think that CGE has another great word game hit on their hands, and I do think that it’s different enough from Codenames to both belong in a game collection. For those that might say that this is just a copy of Taboo – it’s different in that you get to come up with the words that trap your opponent. Not knowing what the trapwords are makes this a completely different sort of game. Others have compared this to Banned Words, a 2017 release from Wonderforge. I have actually also played that one and had reviewed it last year – https://opinionatedgamers.com/2017/07/29/dale-yu-first-impressions-of-banned-words/ While the two games are similar, they are different enough to both belong; and the designers of Trapwords affirm that they have independently designed their game. Though you can read the full review; Banned words has you making a list of 16 banned words per round while the other team has to guess 5 words. The multiple words and the changed ratio of banned words to target words makes this a little different. Also, there is no board aspect nor extra challenges in the curse cards and the monster rules which also helps differentiate the games. Sure, they are similar, but again, they are different enough to me. Trapwords will end up carving out a space on my word game shelf. It’s hard to say if it is “better” than Codenames, Decrypto, Password, Montage, Krazy Wordz, Haste Worte, Word Slam or Boggle. Each has something different that they bring to the table, and honestly, my choice likely depends on who is playing in the game. This is one that will definitely stay in the rotation, and because it’s new, it’ll get a lot of play this winter. The fact that it can handle larger teams also will get it to the table often.